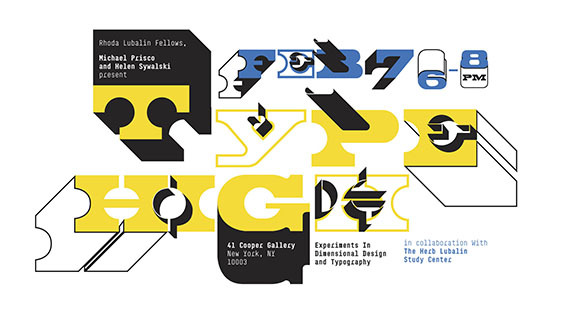 “Type High: Experiments in Dimensional Design and Typography” opens in the 41 Cooper Gallery this coming Tuesday, February 7. The exhibition was designed and executed by Michael Prisco and Helen Sywalski, 2016 graduates of the School of Art. Both alumni were awarded the Rhoda Lubalin Fellowship, an annual prize granted to rising seniors from the School of Art who have excelled in graphic design. The exhibition's title refers to movable type, which was made of wood or lead. Ms. Sywalski said, "Movable type was our entry point to understanding how type works in a physical space, from there we explored calligraphy, relief carving, and signage as points where typography becomes physical. But we didn't remain so literal in our research." 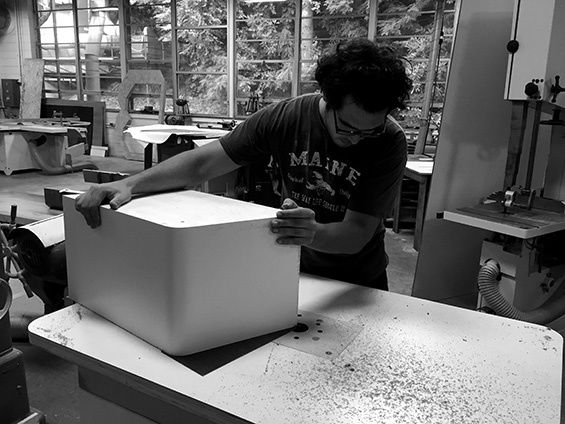 In Mr. Prisco's family workshop in North Carolina, the pair built a set of four-feet tall, three-dimensional letters that will be on view at the exhibition. At that scale, the letters become sculptures and play with depth. 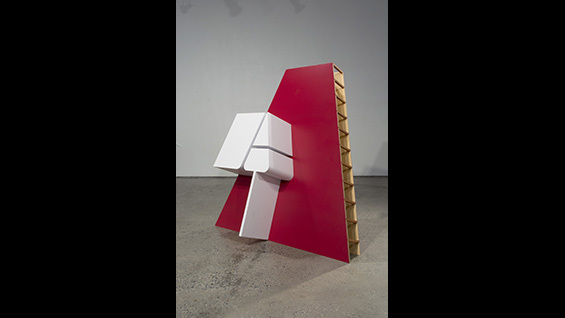 For instance, the blank space of a letter "A" is extruded so that viewers become more aware of its autonomous shape. A letter "C" is laid on its side and can be entered and occupied; seen from above through the windows on the first floor of 41 Cooper Square, it resembles a lone letter against a page. Examples from the Lubalin Archive of typefaces that give the illusion of three dimensionality will also be on display. "We wondered what happens when you inject letterform into that landscape and investigated them as form—image and sculpture, separate from the traditional associations of words. What happens in the translation of 2D to 3D is what we think of as dimensional rather than the sculpture itself." 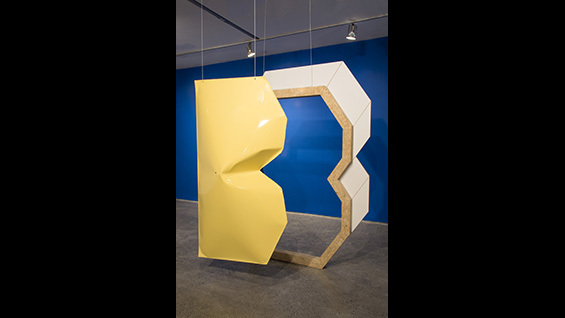 He and Ms. Sywalski view typography as a means of manipulating negative space on a page; the exhibition translates that experience into three-dimensional space at the human scale. In short, the artists said, "We wanted to investigate type as inspiration for form." Endowed in 1987 by Mrs. Rhoda Lubalin in honor of her husband, Herb Lubalin, the Fellowship is a research-based project that uses the Lubalin Center collection as an entry point. Ms. Sywalski and Mr. Prisco had been exploring the center since they were sophomores, so they were already quite familiar with some aspects of the collection. Lubalin fellows are granted a small stipend and special access to the center while they work with the Alexander Tochilovsky, director of the Lubalin Center, and Archive Coordinator Laura Mircik to execute a unique project that will make a lasting commitment to the Herb Lubalin Study Center. "One of the tenets of the Lubalin Center's philosophy and the reason for the archive is that design should be experienced," said Mr. Prisco. "You understand a piece of ephemera in an entirely new way when you can actually hold it in your own two hands. 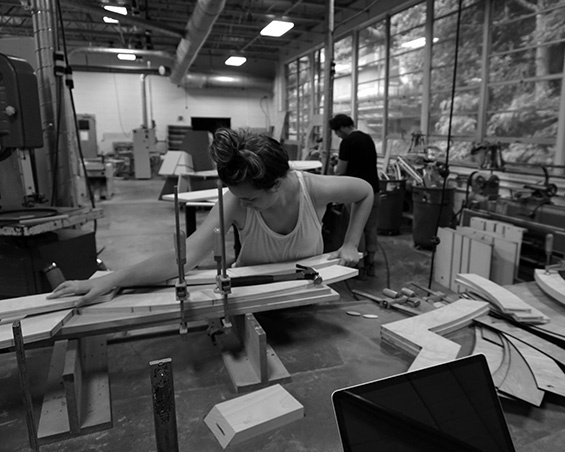 We wanted to create a space for experiencing typography."